Pictured here is the first known non-Kenner® US hardcopy, though since it's discovery other Top Toys hardcopies have surfaced, and the fact that it's an unproduced figure makes it even more significant. It is a hand painted example of a Lando Calrissian (Skiff Guard Disguise). Painted hardcopies like this one, known as paint masters, would have been used for a variety of purposes including photography, samples for trade shows like Toy Fair, or examples of color scheme for foreign vendors. This particular one was created in-house at Top Toys and probably used to test the color matching capabilties for this particular figure to match the US and other foreign licensed paint decos. If you look at the next set of photos you can see that this foreign Hardcopy is held together by metal pins as most domestic Harcopies would have been, though these pins are quite a bit thicker than the style used domestically. As expected, the figure is a bit heavier than a Kenner® production figure. 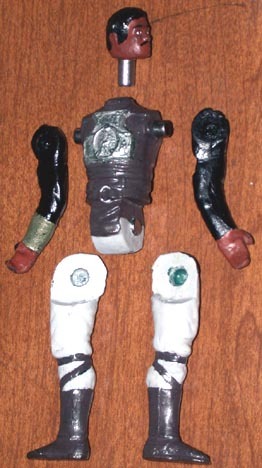 The casting material is two different colors - black for the arms and head, green for the torso and legs. It is unclear whether the torso is made of Dynacast, which became the post-1982 standard for hardcopies, but considering the timeline I think it's a pretty safe assumption. The workmanship of this Hardcopy is no different than that of the standard Top Toys figures, shoddy. One of the leg pins is a bit too short, and one of the arms goes on a bit crooked but with the caliber of work this company is known for that is not altogether unexpected. Because of the way this Hardcopy was created it is slightly smaller than a Kenner production figure. 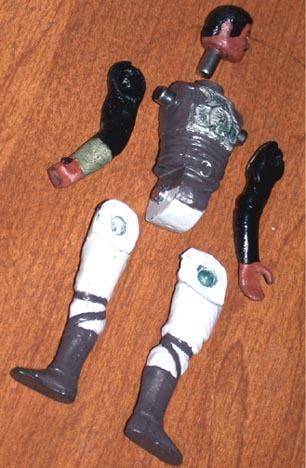 Top Toys basically used Kenner® production figures as the sculpt stage in creating a Hardcopy. As a result of this the Top Toys figures are a bit smaller than their Kenner counterparts. Due to cost, Top Toys chose to make their own molds for their star Wars figures, rather than pay Kenner for molds. Top Toys was a company already manufacturing toys, so they had molding capabilities. This Lando was the initial test of the molds. For a while there was much speculation as to why Top Toys would even have to create thier own Hardcopies but the answer is quite simple really. When a production mold is cut a machine called a pantograph traces the contours of a hardcopy and cuts the mold. A production figure would have been much too soft for the stylus to work, thus a Hardcopy would have had to have been made for tooling purposes. An example of this method being used domestically would be the Hardcopies cast from production figures to create the TRU Classic 4 pack in the mid 1990's. 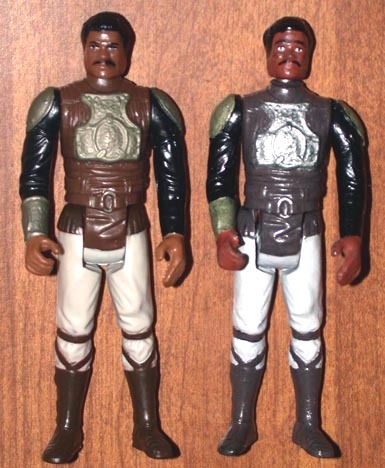 Here's a great side by side comparison shot of a production Lando (left) and the Top Toys Hardcopy Lando (right).Please note that the Lando pictured is for comparison purposes only and is not the exact Lando used by Top Toys to create the Hardcopy. It is stated that the requested tests on the 1229 article were performed and with regards to the color charts (141a, 256a, 147/4, 19a) annex we want to inform you that it is in optimal condition for its production. In accordance with the corresponding norms of the quality control department. Without any other issue we are just waiting for your instructions to present the corresponding assessment of the article in question, as it was previously requested. 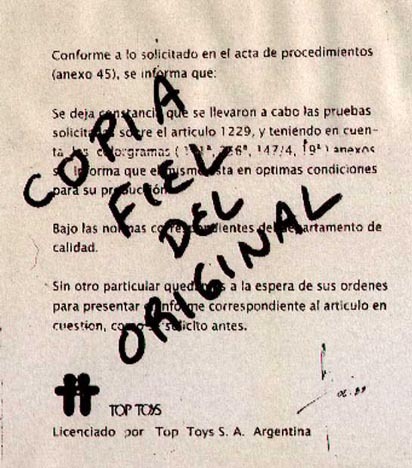 Licensed for Top Toys S.A. Argentina"
Foreign to the US prototype material is few and far between but thanks to the diligence of collector Matt Brand this stash of Top Toys prototypes was unearthed. In this stash are a Top Toys Presentation Board, an unproduced Lando Calrissian (Skiff Guard Disguise) Hardcopy, and a Top Toys licensing sheet. Subsequently, Matt's source opted to offer some more prototypes on a popular auction site through two seperate brokers. Among these other protypes were carded samples for Luke Skywalker (Jedi Knight® Outfit), Stormtrooper, Chief Chirpa, and Darth Vader, as well as laser copies of an additional unmarked proof or comp sheet.